2 years ago…We tackled our first major project. 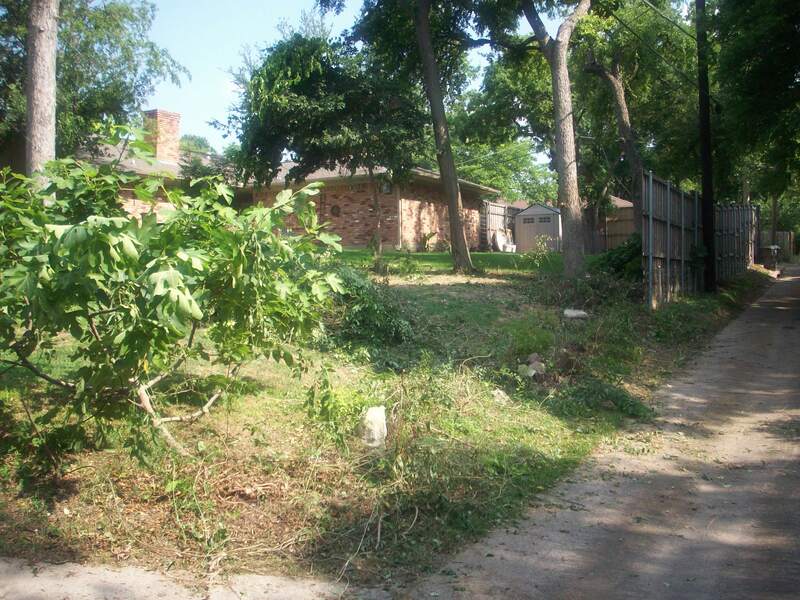 Here’s what our backyard looked like the first time we saw it ….. 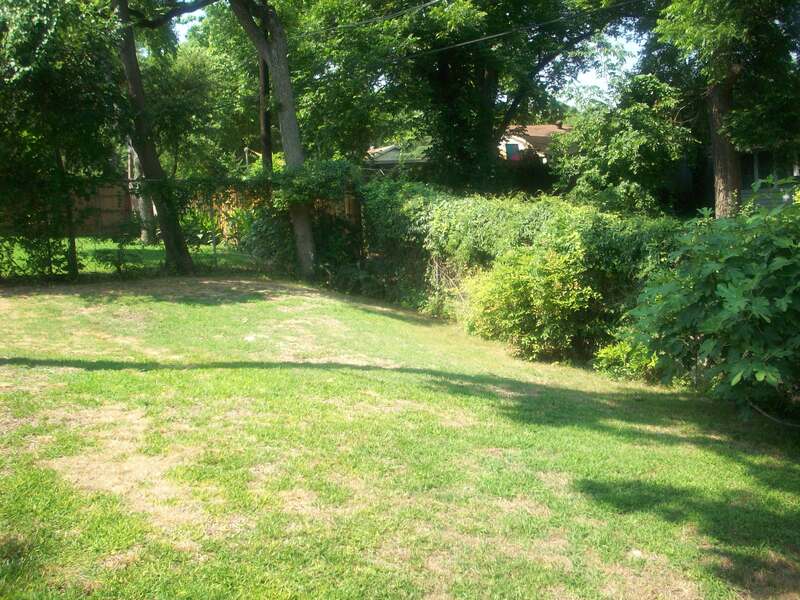 Huge backyard for our neighborhood, But a chain link fence?.. Not at all. And completely covered in honeysuckle, trumpet vine, and morning glory. It just looked unkempt. 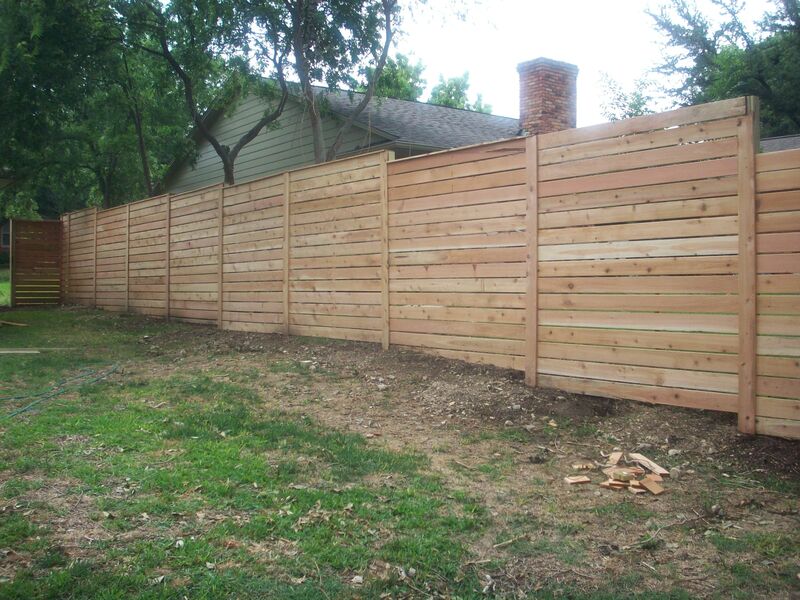 We needed an actual wood fence. A horizontal fence to be honest. 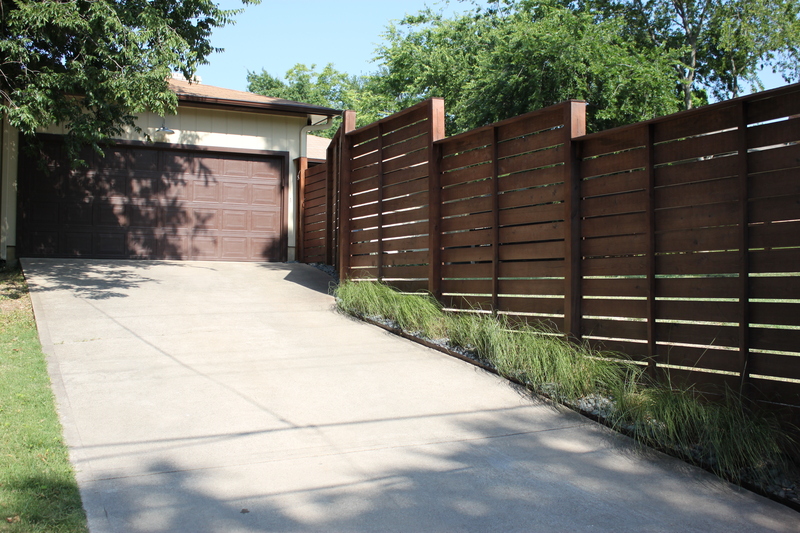 We met with 7 different contractors/fence builders……and none of them would build us a horizontal fence ( for a reasonable price, anyway). But the 8th one we talked to was willing to take on our challenge. All right for you Jack! He tore out the chain link….and left the fig tree. Yeah! 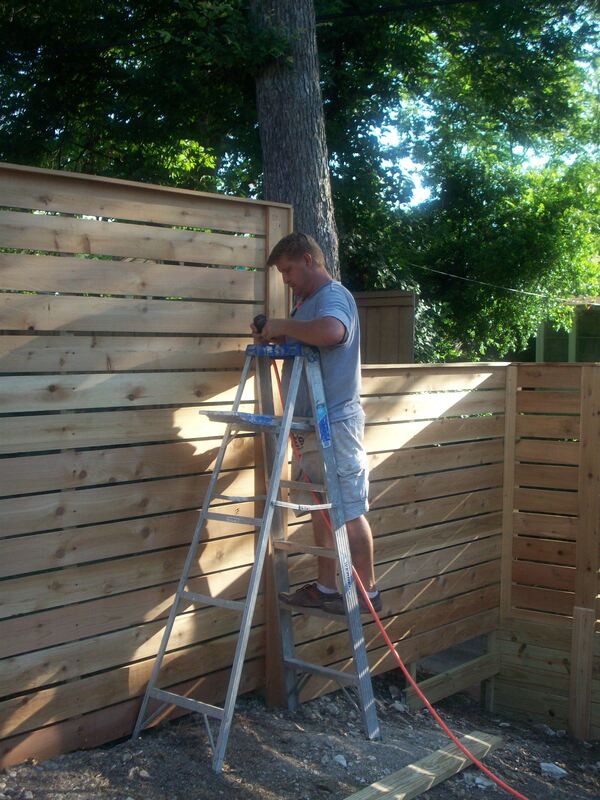 And started building our horizontal cedar fence..
We Love it!!! Love it so much. So, Very, Very, Much. 2 years ago… (slowly shakes head and sighs) We built it……but never stained it. Well all that changed this week……We finally stained it. Now it’s russet. Beautiful color this russet, warm brown..slight redish tint. 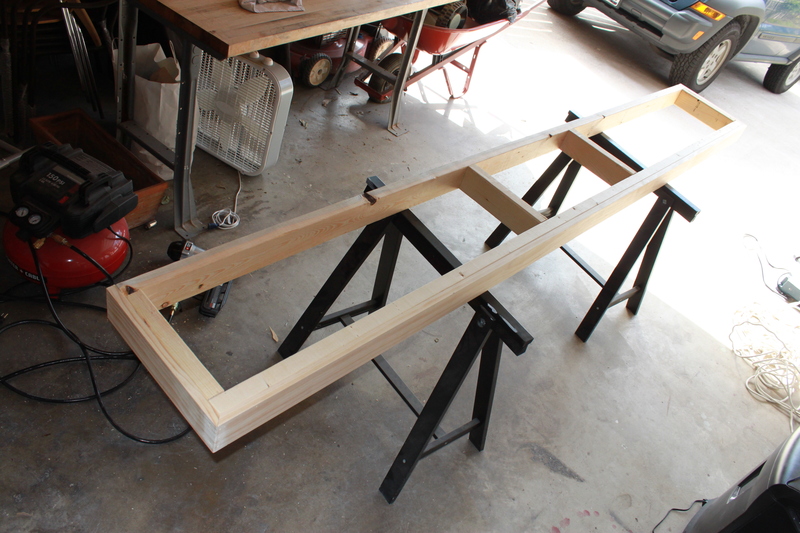 Semi-transparent stain/sealer with 25% colorant added…so it’s not too dark/not too light. Looks great. ( by “We”, of course I mean our dear friend Chuck who did the actual work) Remember Chuck? He installed the new electrical panel a few months ago. Well, he came back. 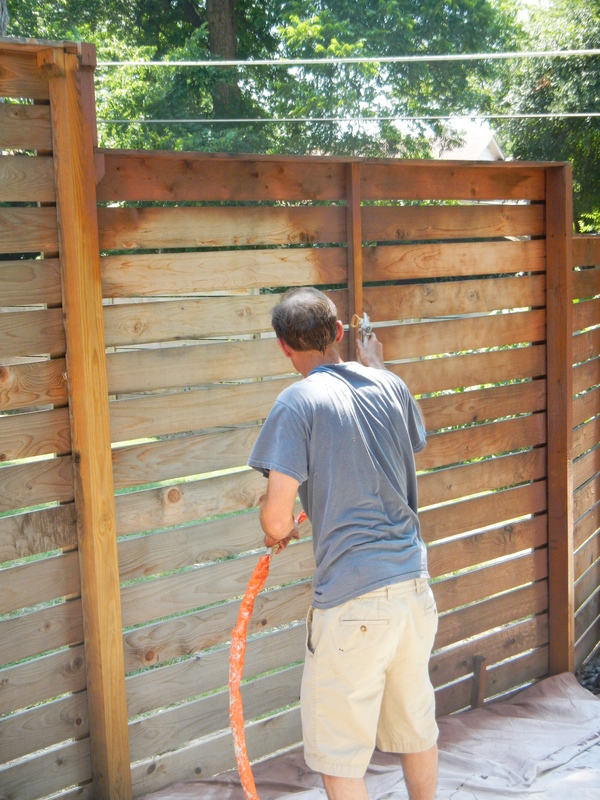 Chuck started staining by hand, but just for about 2 feet of the whole fence……then he and Jamie rented a sprayer. Aaahhh, slightly faster process. In 2 days time, you can tell this by Chuck’s wardrobe change, he had that baby looking like a million dollars. Every shot I took straight on in the backyard had a blurry Doberman in it …so there ya go. How was that Steven? 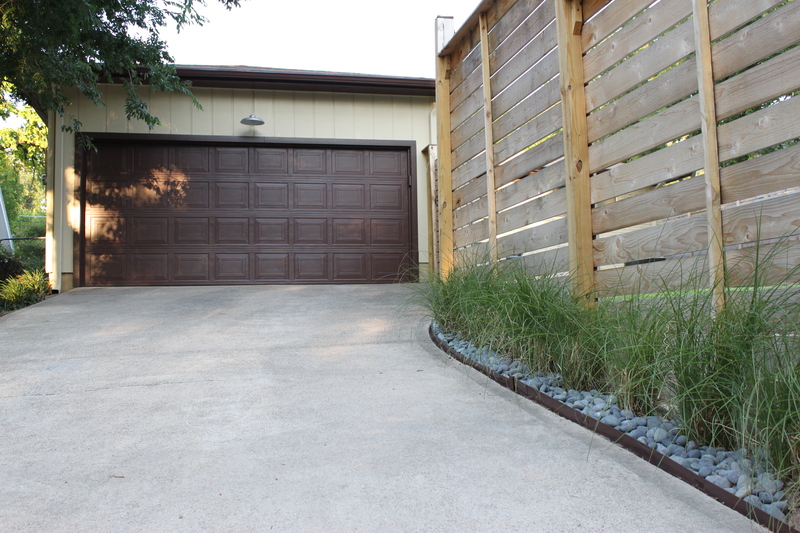 More of what you wanted to see?….Shutters are next BTW. No one can find our house…. What the Hell ? We hung new stainless numbers when we moved in….I can see them in the picture on our header. See them up there? Right over the mailbox? Well , you can’t actually see them from the street. 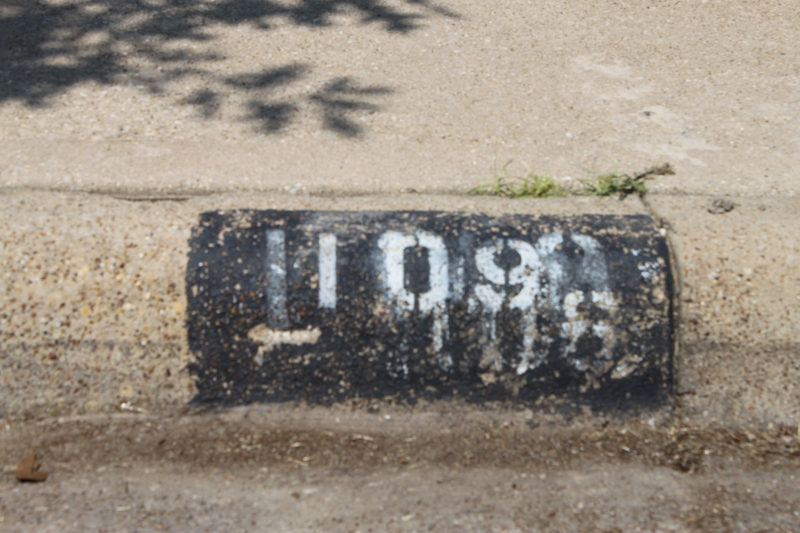 When I took a look at the curb I saw this….. I wouldn’t be able to find us either…How many numbers are painted on there anyway? Something had to be done…So we set out to repaint them. 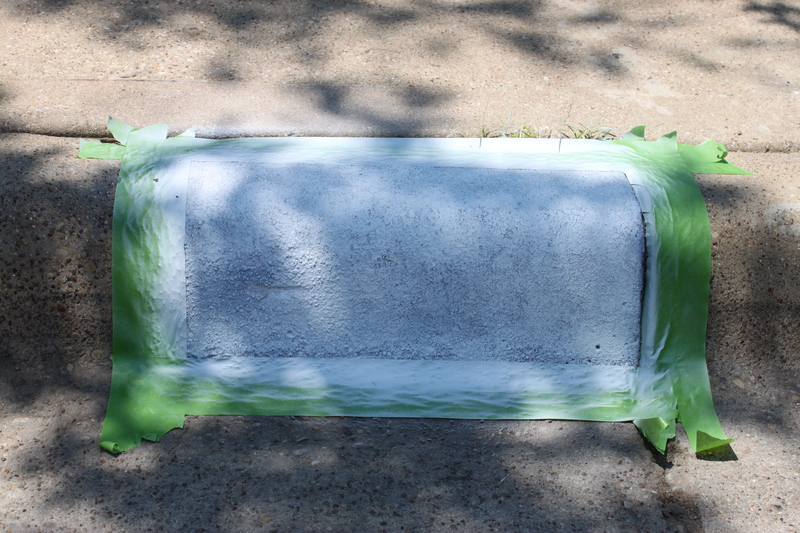 I started with frog tape and white spray primer..
Frog tape is amazing…….The trick with spray paint is to do several light coats. It shouldn’t look perfectly solid until the second or third coat. We primed the space white first because we wanted to do more than just “stencil” the house numbers. We found these 5 inch adhesive house numbers at the H-Depot. I cut them out of the little white rectangles with scissors and an exacto knife, then stuck them on our new primed white rectangle. I put them just slightly higher than center, so they would be on the top part of the curb. Next I sprayed a couple of coats of the black primer over the whole deal. The heat of the day kept everything drying pretty quickly. I carefully peeled up my frog tape and the adhesive numbers….and had this perfection…. 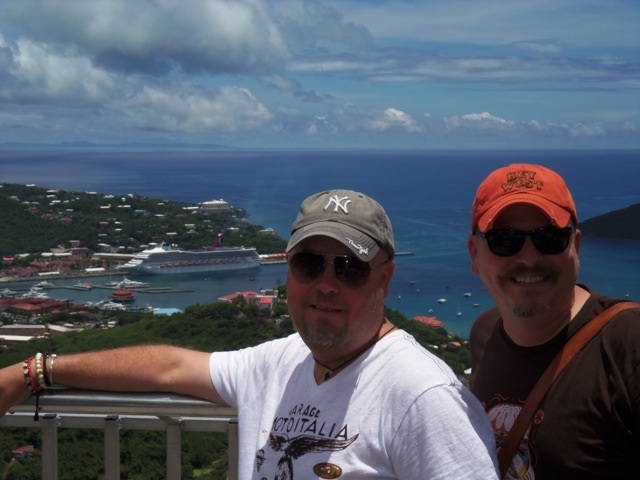 Last year we “stepped outside our comfort zone” for a vacation and traveled to St Croix instead of Key West. We saw it for the first time on “House Hunters International” ( I know, first mistake ) and thought that it looked like a pretty cool place to visit. But it wasn’t cool, it just sucked. It sucked in a major way. We landed about 1 hour before hurricane Irene. The island was abandoned, decimated, and shut down for most of our stay. We couldn’t swim in the rough, dirty ocean, there was an island curfew of 6pm, and although we were electricity-free for most of our stay…our resort slapped a fee for power on our final bill. 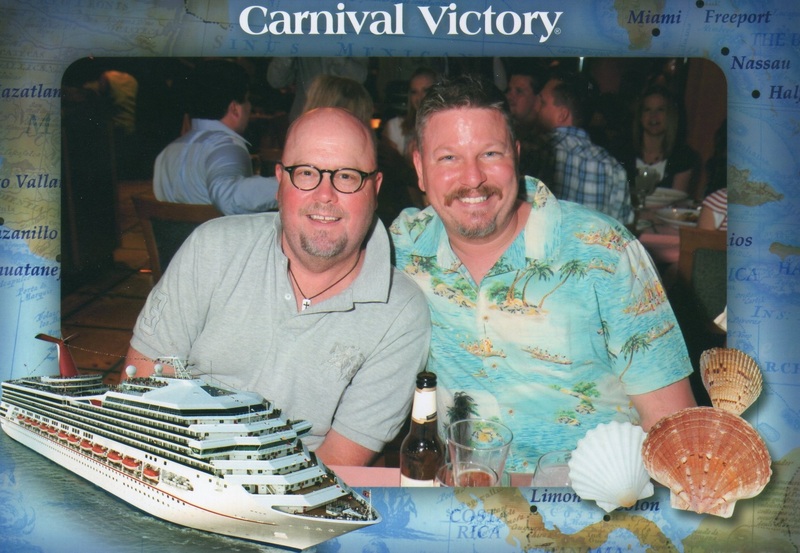 When our dear friend Kylie, who works for AAA Travel, suggested a Caribbean cruise……..we were naturally a little resistant at first. But the price was just too good to turn down. Neither one of us has ever been on a cruise before; and Kylie and her husband Gert would be going with us. We traveled with them a few years ago when they got married on Maui…..and then we stuck around and intruded on their entire honeymoon as well. Kylie and I have been friends since we worked together at Macy’s over 20-somethin’ years ago. Oy-Vey, 20 years…..
What the Hell? They were fun to travel with, and with acquired miles to fly on, the whole trip was practically free. 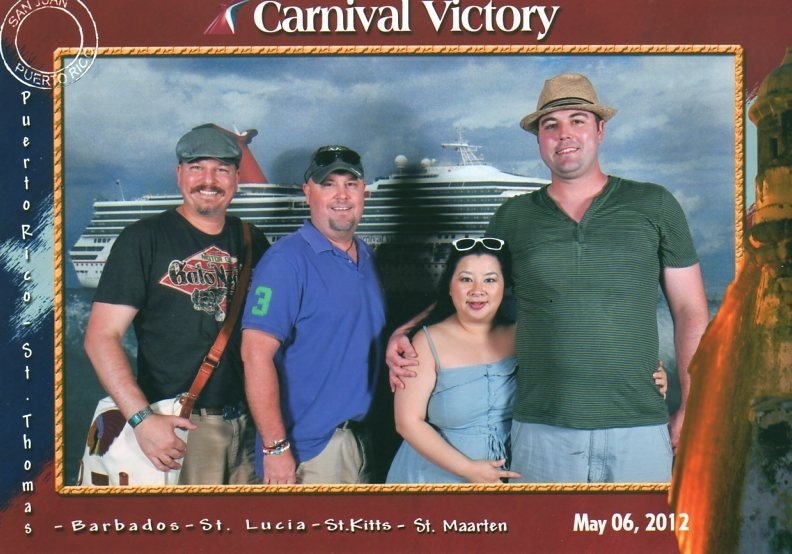 We were sailing out of Puerto Rico so we spent the night before in San Juan. Absolutely loved it. It’s very similar to Miami in feeling. 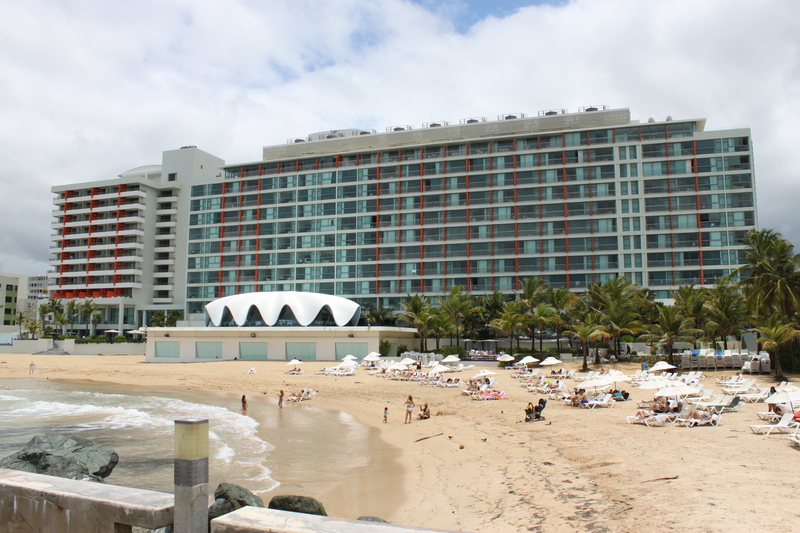 When Columbus landed on the island in 1493, he named it San Juan. This makes sense because most of the Caribbean islands are named after saints. When Ponce De Leon landed there in 1508, he exclaimed, “Que puerto rico!” ( What a Rich Port ) and the name stuck. San Juan became the name of the first settlement. This is the La Concha hotel where we stayed. La Concha means ” The Shell” in english, so I’m guessing that is pro’lly why there is a giant clam shell for a dining room. I was pleasantly surprised to find that it was right on the beach. Very “Hip” Hotel…we plan to stay there again when we go back. Did I mention that it was across the street from Louis Vuitton? Well, it was. I snapped this pic of Jamie sitting on the sea wall behind the hotel. Here’s our dear friends Gert and Kylie with the San Juan coastline in the background. 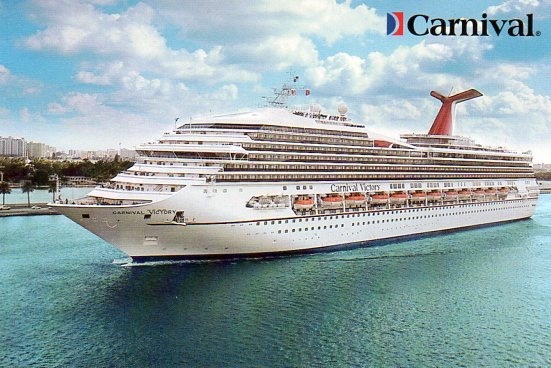 On Sunday morning we boarded the Carnival Victory for a 7 day, 5 island tour. 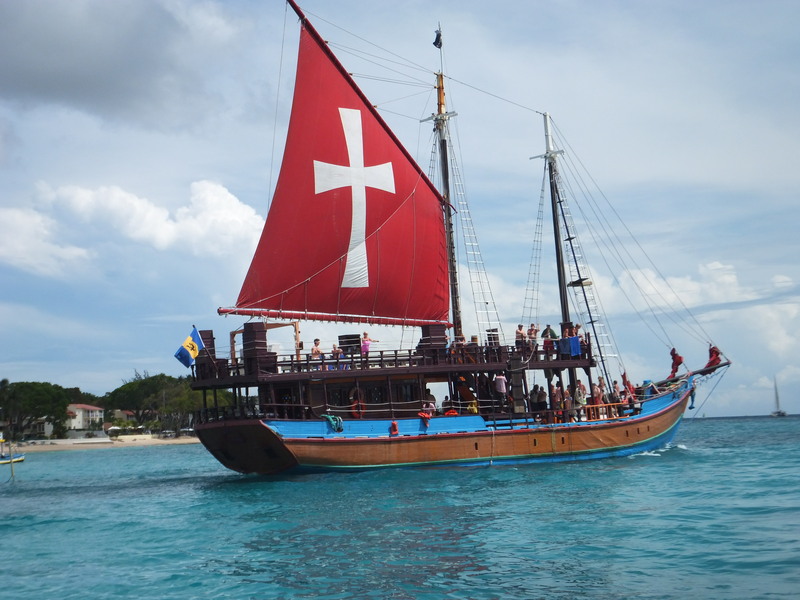 St Thomas, Barbados, St Lucia, St Kits, St Maarten, and then back to San Juan. This is the cheezy picture they surprised us with right after customs. I know, pretty goofy. Especially the backdrop. 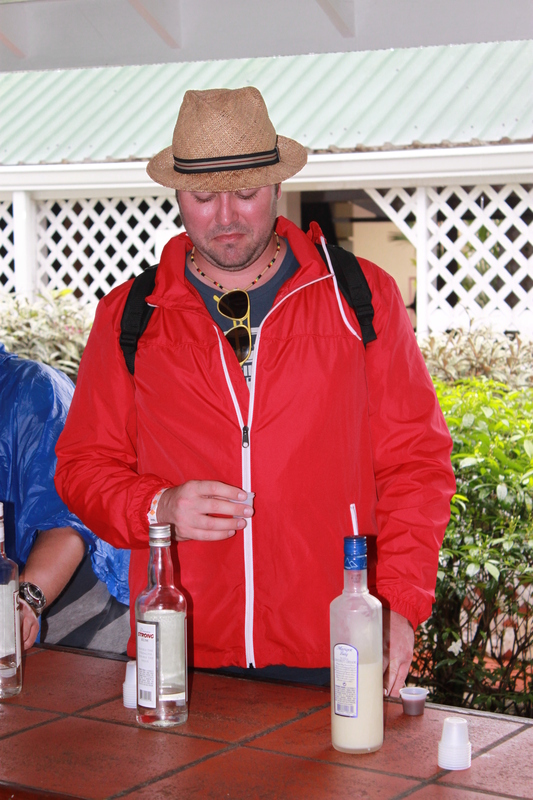 BUT this is by far the Most Flattering picture of Me the entire trip…..just keep reading, I’ll prove it. Our room was actually a decent size, I was expecting way smaller. Like a pop-up Air Stream trailer with a toilet in the middle of the shower. But it was actually pretty livable. Waiting for us there was champagne, chocolate covered strawberries, ………………..and 2 twin beds. 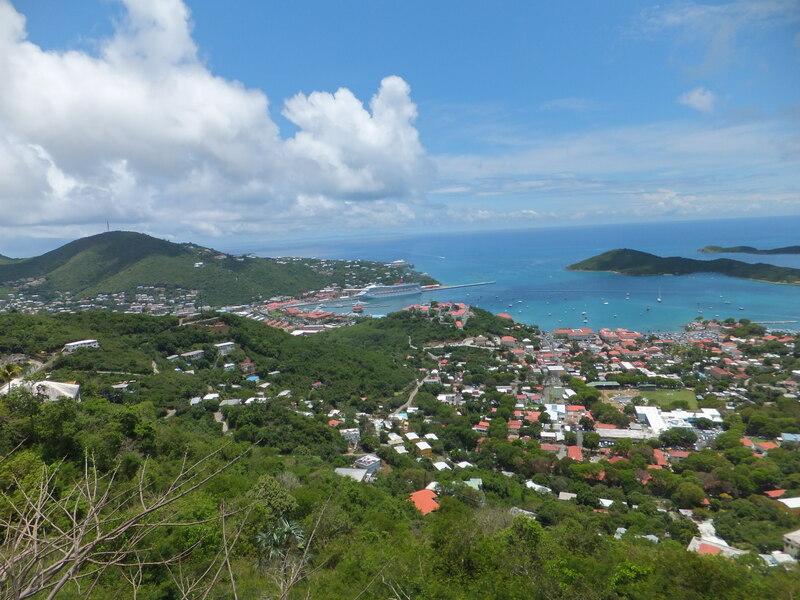 Monday morning we woke up in St Thomas……BREATH TAKINGLY Beautiful…See for yourself. This is the view of the bay we were in. 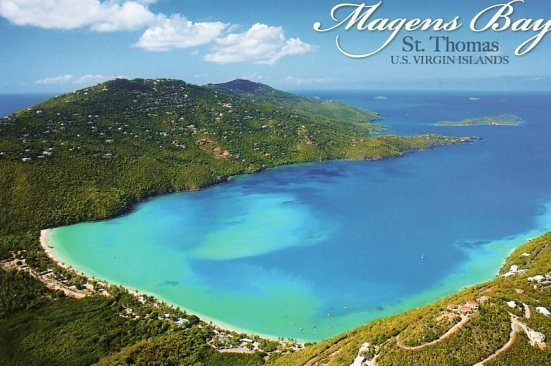 Just Amazing…we decided right then that our next trip would be back to St Thomas. That’s our ship docked right behind us here. 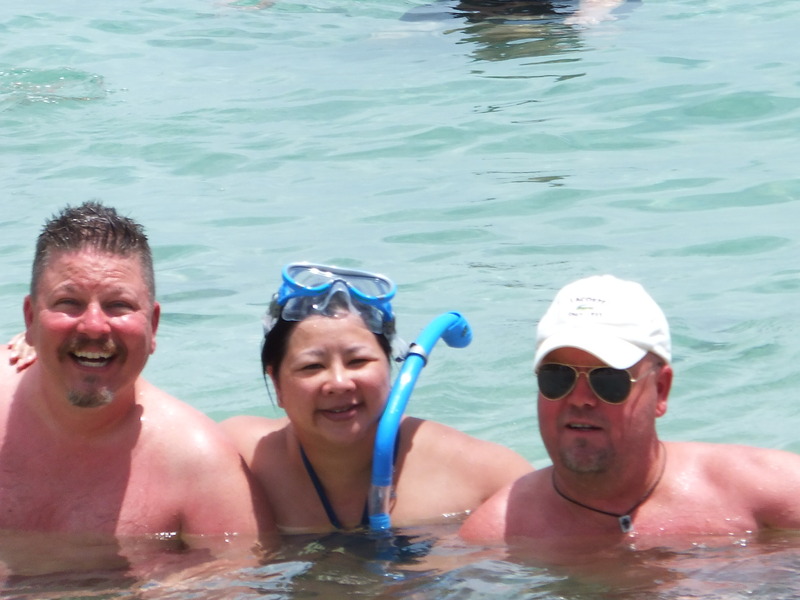 We spent the day snorkeling at Magan’s bay with the sting rays. Can you believe it? This is where we swam all day! Lunch was at Senior Frogs. ( Huge Sigh ) It’s pretty terrible Mexican food for spring-breakers, and they made us wear balloon hats, but it was the closest restaurant to the boat.. The next day was an entire “Day at Sea” while we headed to Barbados. 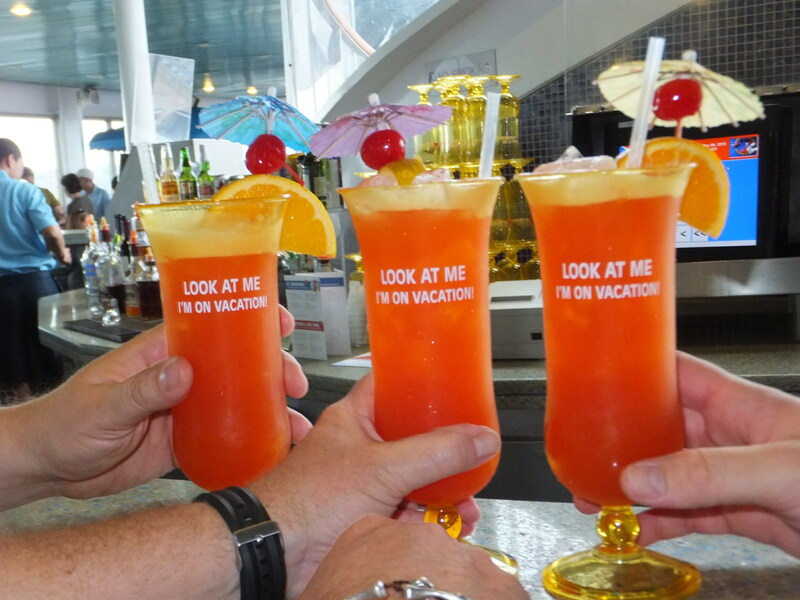 We boys kept ourselves busy all day…with these…..Don’t be fooled people, there’s about 1/8 an ounce of rum in each… and only 8 bucks. 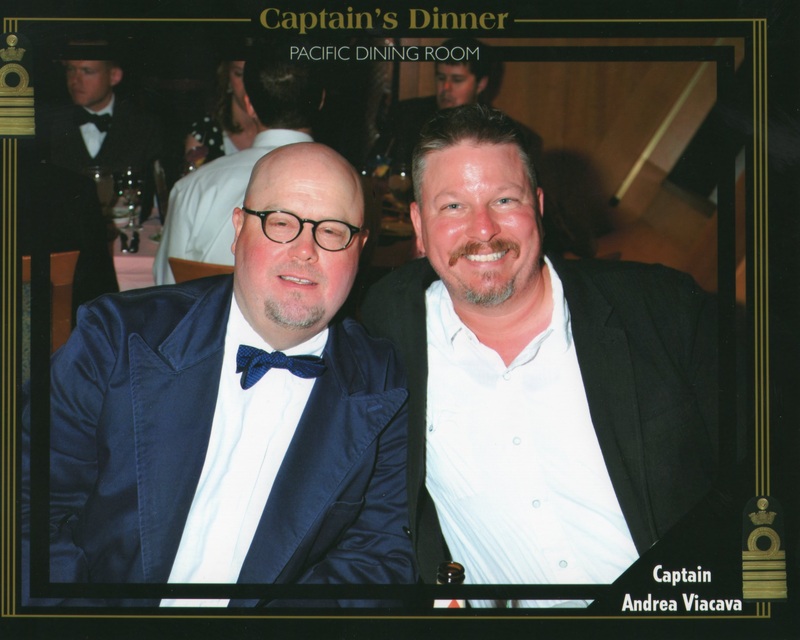 We had heard of formal night on a cruise ship before, but didn’t really know what to expect. After all, it was a Carnival Fun Ship, not a ball at the Plaza. I’m just glad that we brought long pants and sport coats. Jamie packed a bow tie. Everybody else on board took it very seriously… like it was an adult prom. There must have been 20 photo booths set up on our way to dinner and people were lined up for days to be photographed in “Hoochie” gowns and rented tuxedos in front of canvas backdrops of Grecian columns and lavender fields. WTF? 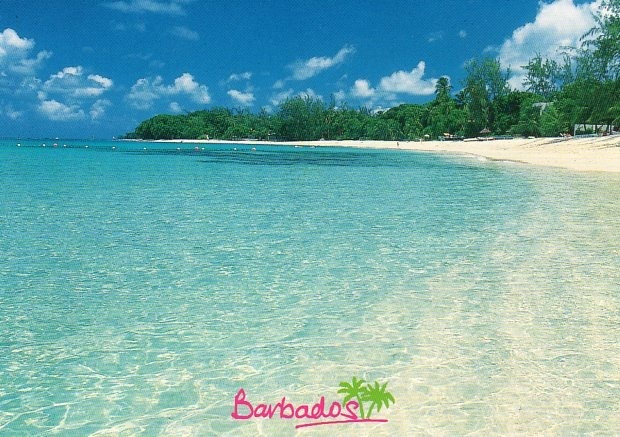 The island of Barbados was not nearly as beautiful as St Thomas, and we were hounded all morning by cab drivers wanting to show us the island. Realy hounded. Luckily we had plans to swim with the sea turtles. 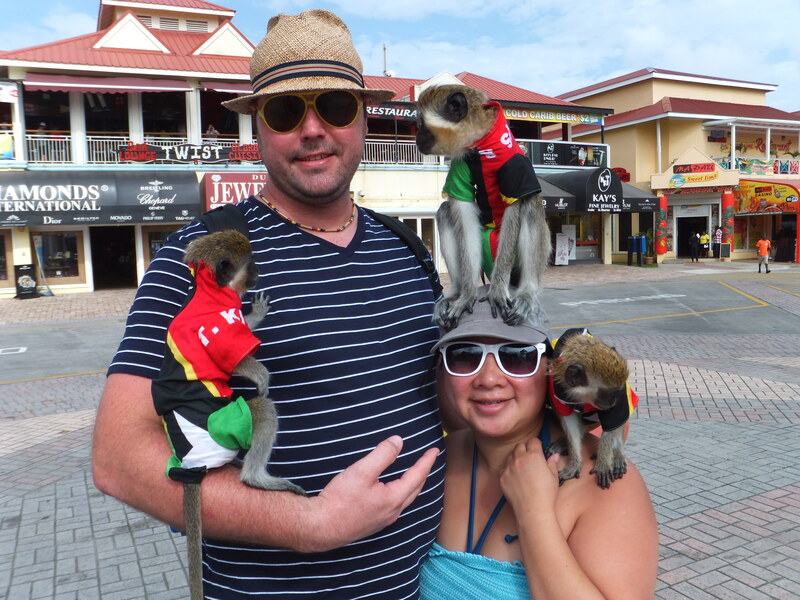 All 4 of us had already done this on Maui…so it was a little uneventful. The other 40 people on our excursion hadn’t….so the water was a little crowded, but still a beautiful turquoise. The St Lucian’s are very proud of the two Pitons at the south end of the island. Pretty sure that I am blocking one of the mountains…Thanks Kylie. Our catamaran pulled into a little cove and we were accosted by natives on little canoes selling conch shells, carved turtles, and ( ahem ) weed. ” I got da medicine, Mon” was the call. We bought the first 2 items. JUST, the first 2. What sugar cane is still produced on the island is used in making rum. Luckily he took us to a rum distillery. 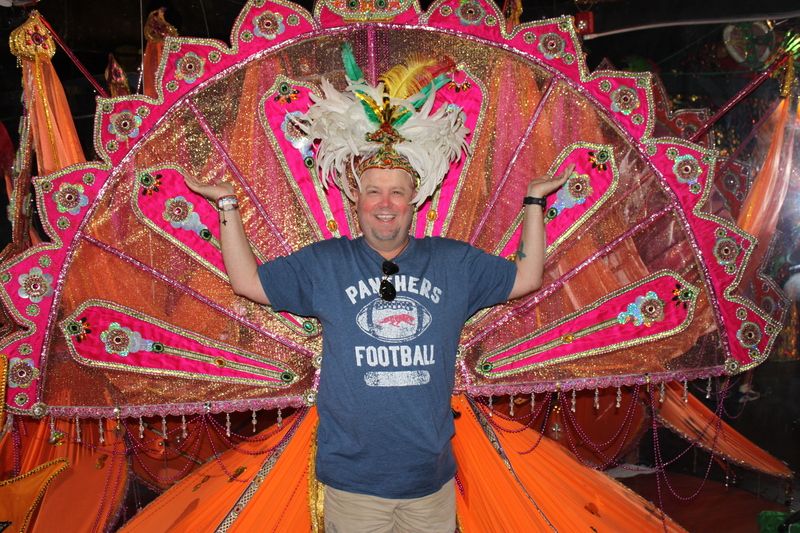 Where we sampled the rums….Coconut, Lime, Coco…..
And tried on the costumes that the natives wear for the “Carnival” festival. 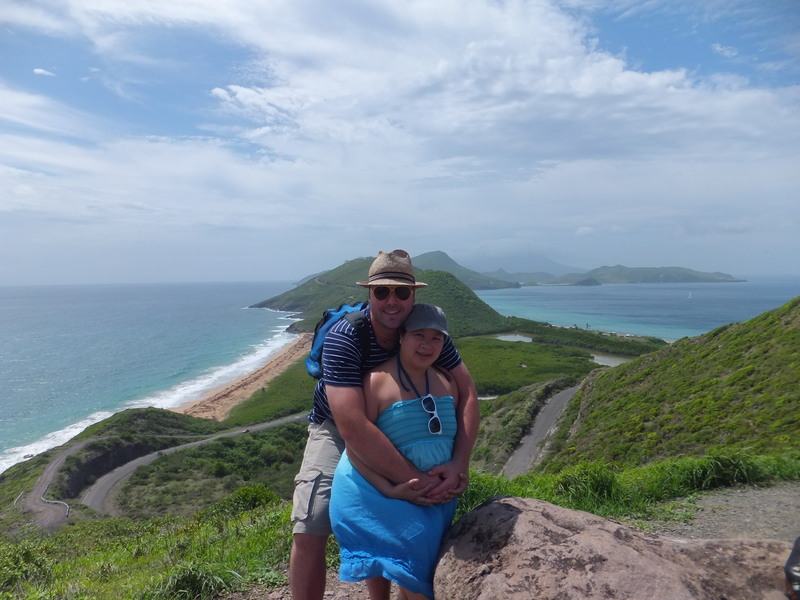 On Saint Kitts our cab driver, Bingi, took us to the southern arid part of the island where we could see the Atlantic Ocean and the Caribbean Sea at the same time and the sister island Nevis. Atlantic to the left, Caribbean to the right….Nevis is straight ahead in the mist. There are about 400 documented ship wrecks between these two small islands. Then he dropped us at Reggae Beach for the day. It was one of those places that you see in the movies, where people bring frozen drinks and conch fritters right to your beach chair. They also had women offering aloe messages for $35, but none of us partook in one. We rubbed aloe on each other for free every night …so, no big loss. 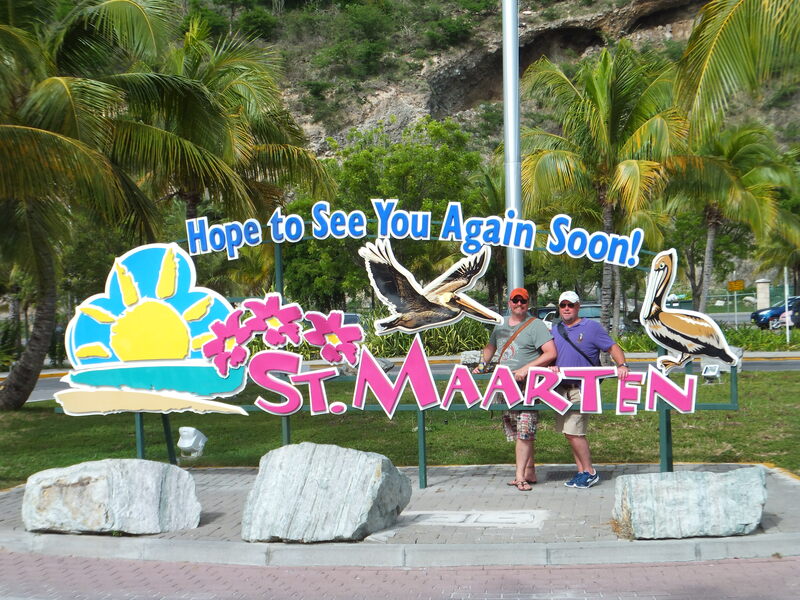 Saint Maarten was our last island to visit. 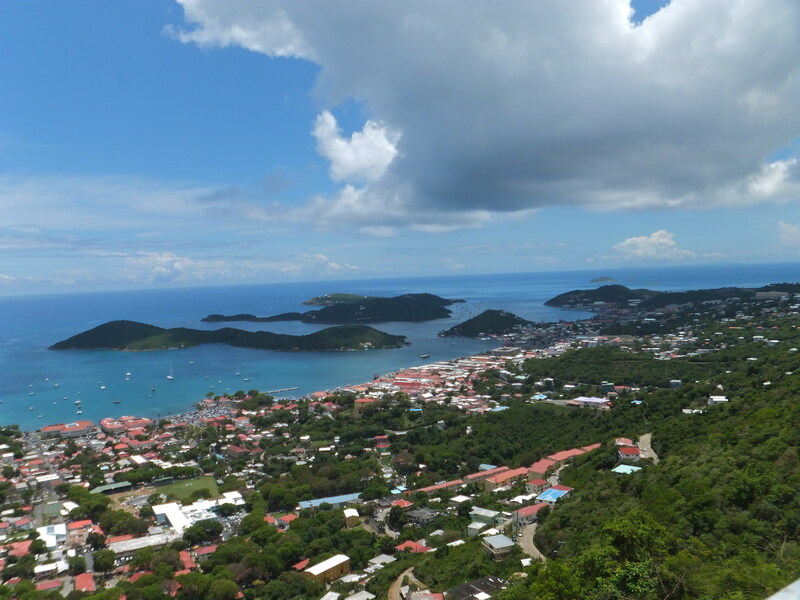 Just as beautiful as Saint Thomas….think we might be headed back there as well. Can’t quite explain why I am doing the third ballet position in this picture. Kylie had read that there was a sunken galleon that we could snorkel over. The first 2 guides she talked to told her that the only way to reach it was but $50 excursion, but the 3rd person she spoke to had a different answer. ” Just go to Little Bay and swim out to it, Mon.” So, swim from Little Bay we did. It’s hard to tell in the water, but I think it was maybe half a mile out. Not only was there a sunken galleon, but a helicopter and a submarine too. There weren’t many fish; Kylie saw a small shark, and I saw a barracuda. That was about it. All those machines underwater was just kinda creepy. Back to the ship for our last dinner. We never did drink the champagne from our cabin, so we did that night. Just as we emptied it, some friends that we met on our first night aboard sent us a second bottle. The horror. We were forced to down 2 bottles. And yes, that was the amazing view from our dinner table every night…we were at the very back ( stern ) of the ship. I said earlier that none of us had ever been on a cruise before and were expecting the worst. There were about 2,000 tourists and 1,000 crew members…..and I was anticipating that all of them would be in my/our way the entire trip. But it wasn’t like that at all. We had a great time, and would do it all again in an instant…..
A few months ago, we did a detailed photo shoot of our den. Everyone seemed to love our TV surrounded by pictures. 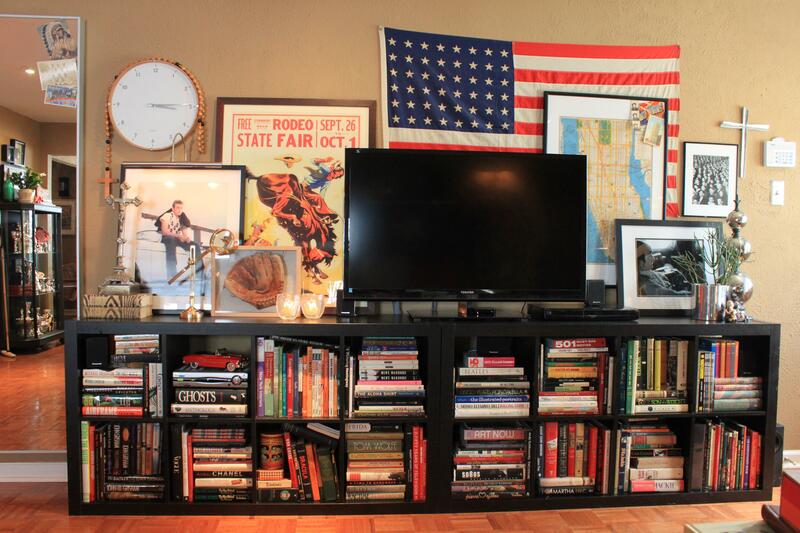 We thought it was a clever idea to use 2 Ikea bookcases turned on their sides as our television console…. It was clever, it just wasn’t complete is some way. I am one of those people who is never satisfied with something the first time I do it. I had always meant to build a base for it to stand on…Something that made it look a little more like a piece of furniture and not a couple of Ikea bookcases on their sides. As usual, I broke out the power tools to build a 2X4 base with a well-mitered select pine 1X4 trim on the 3 showing sides. Then I stained it with water based Ebony stain. Water based stain dries quickly, washes off hands easily, and doesn’t have toxic fumes. We took this opportunity to take everything off the console, dust profusely, and even rewire all the TV components…..’Till it looked more like this…..
It’s a sad thing when a relationship is over. We had some Great times together. He was right next to me almost every day of my life for the past 5 years. He worked next to me every work-day. Every flight I took, he was right there. Every mountain I climbed, he climbed it with me. After 5 years together, we I have decided that he won’t be joining me on my next trip ( a Caribbean cruise tomorrow ). Of course, I’m talking about my canvas “Man-bag” with the Indian patch. Who did you think I was talking about? I found him at Rugby, on the sale rack no less. Heavy canvas/ recycled sail cloth, leather strap and buckles. And the price? 22 BONES. Un-freaking-believable!..How could I pass that up? That patch, I sewed that on myself a few weeks later. It’s my very favorite part. It’s time to part ways. I just don’t think he is in shape enough to travel anymore. In actuality, he’s kinda gross, just down-right grungy dirty,( dirt, chocolate, blood?, red wine?, grass, indigo, possible elephant dung – just don’t ask – ….) He’s supposed to be a little weathered……but not “sticky”. No worries though, I have an absolutely unused exact “Back-Up” ready to go. Remember that they were only 22 bucks? and the patch 10. I have duplicates of several of my favorite things. 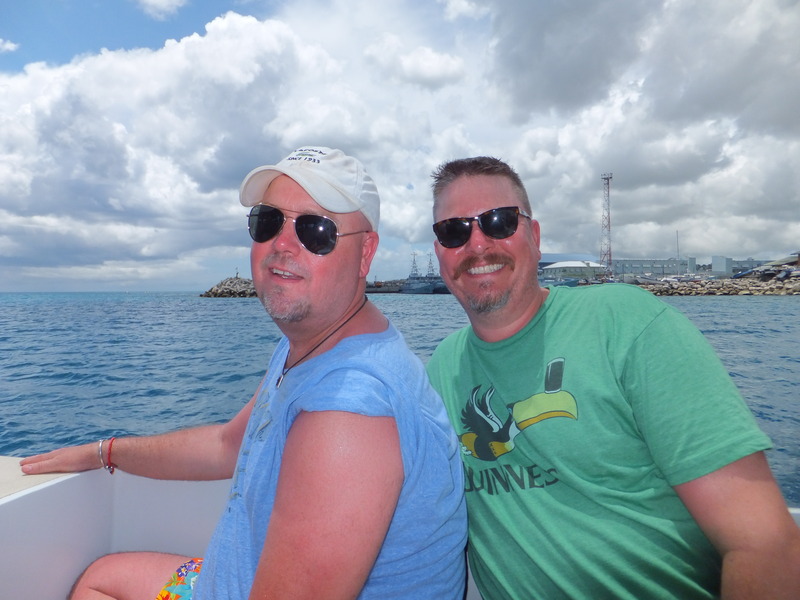 The Cavender Diary will take a brief hiatus, while Jamie and I take a well-deserved vacation…….Unless I can find enough bandwidth to drop a new post. I’ve had a lot of people ask me lately how we can afford to have beautiful live orchids in our house. Simple answer, we buy them at the grocery store…then “Whomp” them up to look like they came from a high-end florist. All those years working for prissy, I mean NICE, florists has paid off. Now I have the chance to share a couple of florists secrets with you kind folks. The big white orchids are Phalaenopsis, or “Moth Orchids”. They are by far the hardest to keep happy at home, and usually only last a few days…maybe a week. Keep them moist ( NOT wet ) and in a bright window to extend their lives. For some unknown reason, the darker the flowers are, the longer the blooms last. I’ve had purple ones that simply refuse to die. If you are buying yours at the grocery store, $15-$25 is a pretty good price, try to buy the ones that have no brown edges, firm – not limp – leaves, and plenty of unblossomed flowers. These will give you the most “bang”. Just like these beauties that I picked up at Ikea for, get this, $9.99 each. I know, they were so cheap, cheap, cheap that I bought 2. Keep them in the plastic pots they come in, just hide them in something more attractive. Orchids are really parasites that cling to trees, and do not like to be buried in dirt. Their roots need to breathe, and they will come in just the right mixture of bark and peat to keep the roots moist but not wet. It took some work, but I managed to shove both plastic pots into this lid-less sugar canister that we use for house plants. 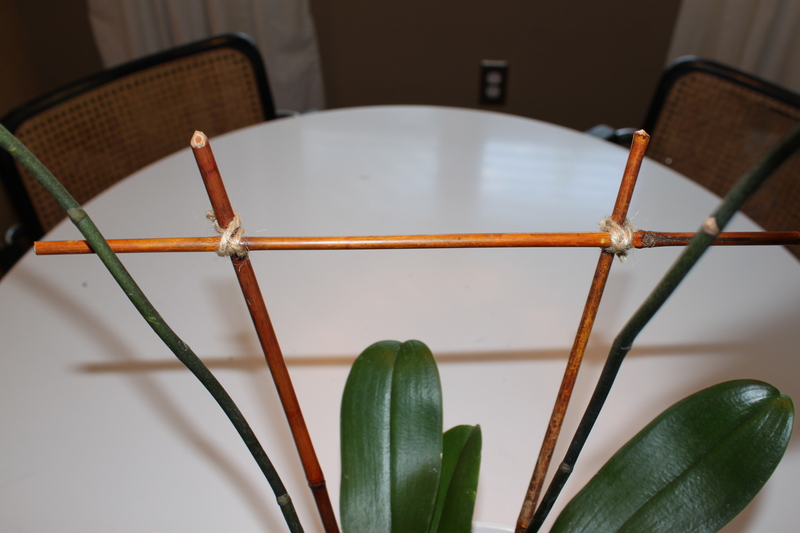 Store bought orchids will have plastic buterfly clips or, even worse, twist ties holding them up on unnaturally green bamboo skewers. Never keep these on….they do NOT look professional. Instead, I replace the whole architecture with natural looking bamboo and jute twine. 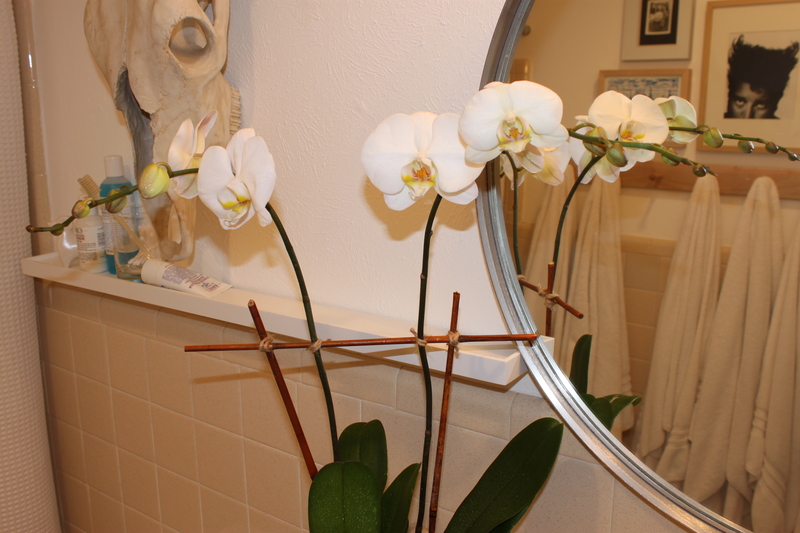 If I have 2 orchids in a pot, I build a little frame like this…. 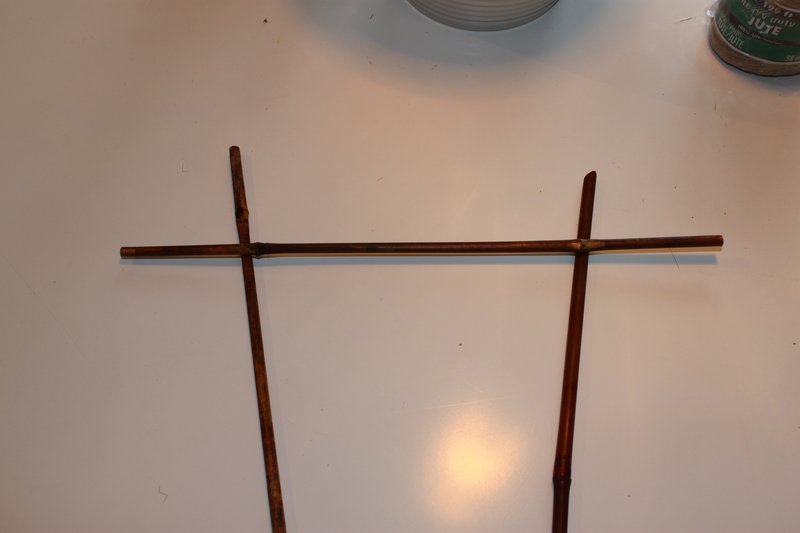 Next I delicately tie the orchid stems to the framework with the jute. I do this pretty lightly so as not to damage or choke the poor orchid. Don’t touch the flowers, that will make them turn brown too. I finish the pot off with some peat moss, or better yet…..shiney white pebbles, to hide all the plastic pots inside. I mist them with fresh water every week or so if they are in a bright window ( with indirect sun ), but the humidity of a bathroom will keep them happy for a while. 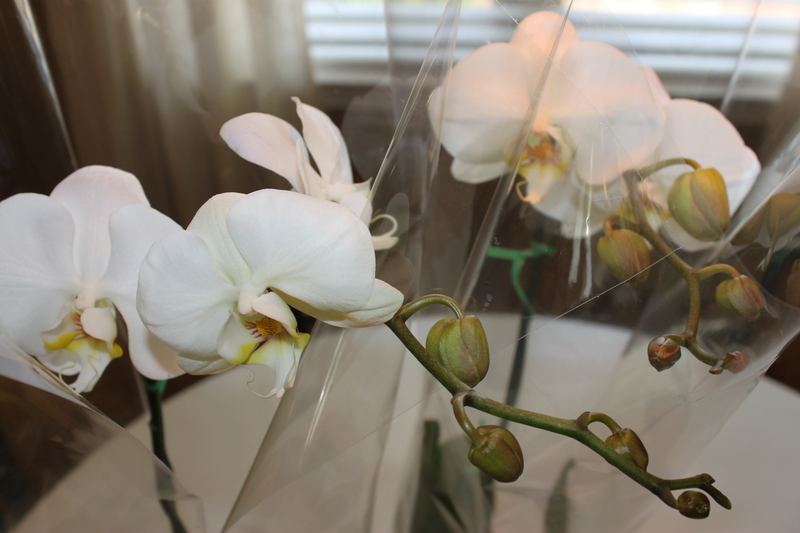 $20 investment, looks like $150 orchid…pretty simple.